Have you ever wanted to learn how to use your blow slot more efficiently? Do you want to learn how to blow glass thinner and make objects faster? 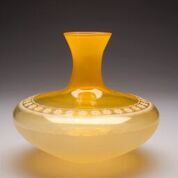 In this course, students will go through an intensive boot camp with glassblowing drills and exercises in order to learn how to control the glass and blow hotter, thinner, and faster. Emphasis will be on building upon your prior knowledge of glass to boost your skills. We will begin with pulled cups, bowls, cylinders, cones, and closed hollow forms that will inspire the individual thought process and design. Students will learn the art of marvering glass and will explore the basics about color applications and surface patterning. From this foundation of techniques, students will work on sketching their original designs, whether functional or sculptural, which will act as the means to bring these ideas to life in glass. Some glassblowing experience is required.